Who wants to spend hours slaving in a hot kitchen in the summer? Horrible. 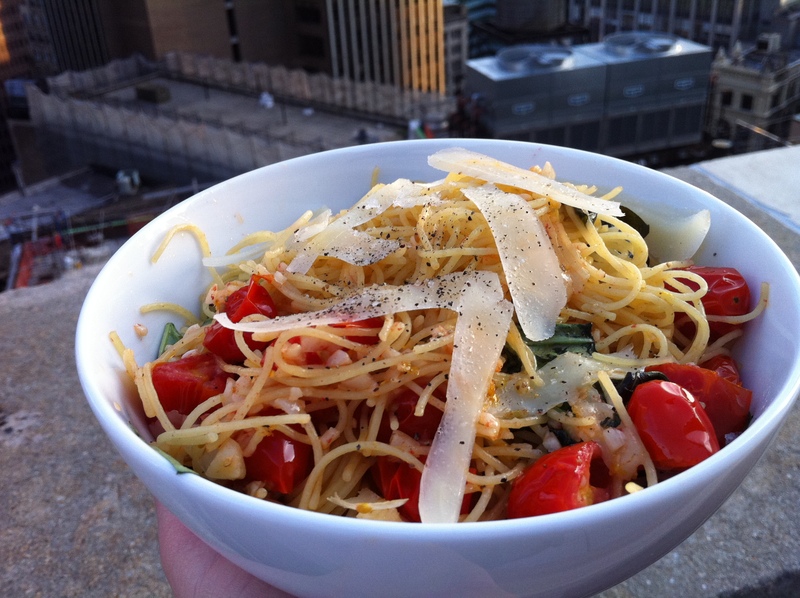 This fresh and delicious pasta recipe is one of my favorite go-to quick and easy summer meals. After a long journey home from a lovely wedding in Hamilton, NY yesterday (cars, taxis, trains and subways, oh my), I still had the energy to throw it together. It takes about 20 minutes from start to finish, and is always a crowd pleaser. This recipe serves three very hungry people, or 4 moderately hungry people. Enjoy! Bring a large pot of salted and oiled water to boil. 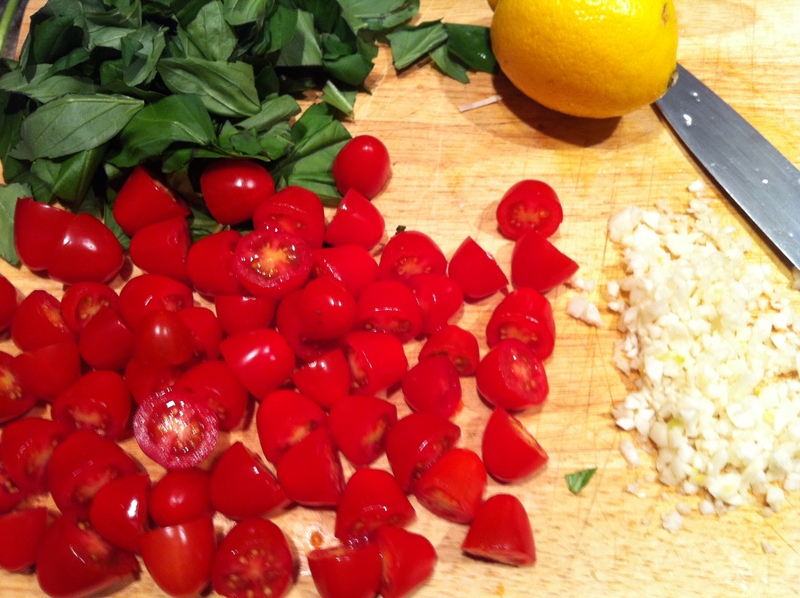 While you are waiting (and not watching the pot…), halve or quarter the tomatoes (depending on size), and mince the garlic. Give the basil a rough chop. Once the water has boiled, throw in the pasta and cook for the suggested time on the box. 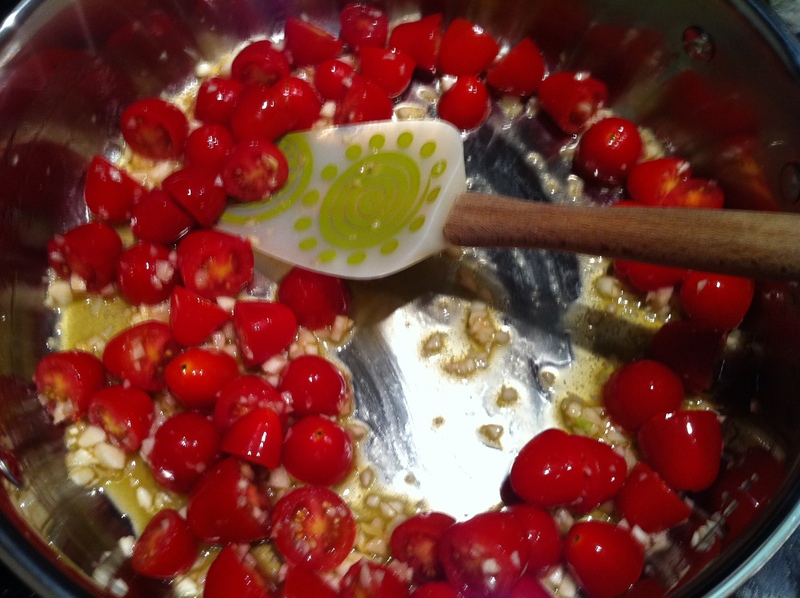 In a large saucepan over medium-low heat, melt about 2-3 tbsp of butter with 1-2 tbsp olive oil. Throw in the tomatoes and garlic and saute for a few minutes. Add a bit of salt and pepper. When the pasta is done, strain it, and throw it in with the garlic and tomatoes. I find that tongs are the best way to combine the pasta and sauce at this point. Zest the entire lemon into the pan, then use a vegetable peeler to finely slice some parmesan cheese into the pasta. Off the heat, add the basil and season to taste. Serve warm with more parmesan cheese on top. Yum! I thoroughly enjoyed this on my sunny roofdeck last night. This entry was posted in Cheap Eats, Citrus, Garlic, Lemon, Quick & Easy and tagged basil, dinner, easy, garlic, parmesan, pasta, PDQ, quick, tomatoes. Bookmark the permalink. This looks delicious! Love your spatula!